The summer is really heating things up including the fishing here in south west Florida! White bait is FINALLY returning to our beaches, which is a great sign. Just this morning our cast net was finally full of larger greenbacks and a few other random white baits! Right away I threw a green back on and headed down the beach, with in three casts I was hooked up on a juvenile beach snook! Bigger game fishing has been better at night! The Goliath Grouper have been putting on a show recently from Venice to Fort Myers these guys are hungry and loving fresh stingray at the moment! Remember these guys are protected so it’s important to keep them IN the water during dehooking and pictures! A number of local captains are tagging Goliaths! Anglers please keep a look out for this and write down tag numbers if your lucky enough to get a recapture! Chris from Indiana was in town visiting his sister and had a blast hooked up on this guy! Last but not least SHARKS! They have been few and far between recently. Bigger sharks have been moving north towards Tampa following tarpon. Monday we set out for some night fishing with our shark reels. We arrived at the beach to find Jim & his family and friends setting up to do the same! 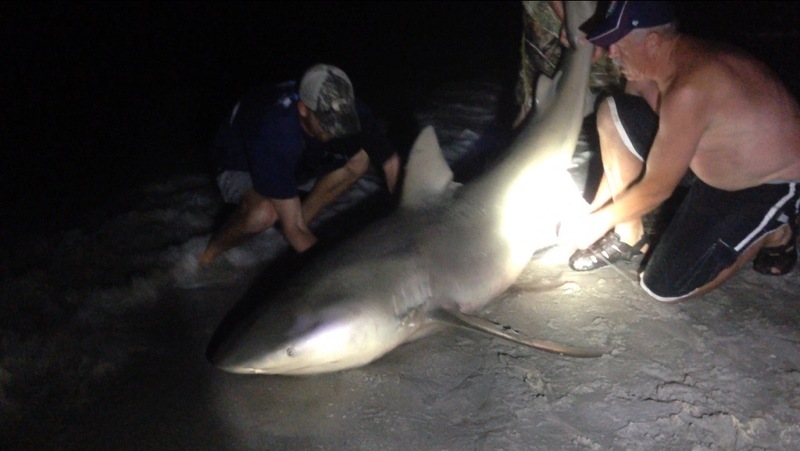 We met them earlier in the year and they hoped that tonight they would finally be successful and land their first shark! Shortly after sunset their penn 130 started screaming! I ran over to help Jim get harnessed in and we all cheered him on as he reeled! We were all making guesses on what was on the other line, after about 15 mins his beautiful 8 foot bullshark came up in the surf! Andrew went in to grab her and tail rope, we quickly tagged her and snapped some pics! 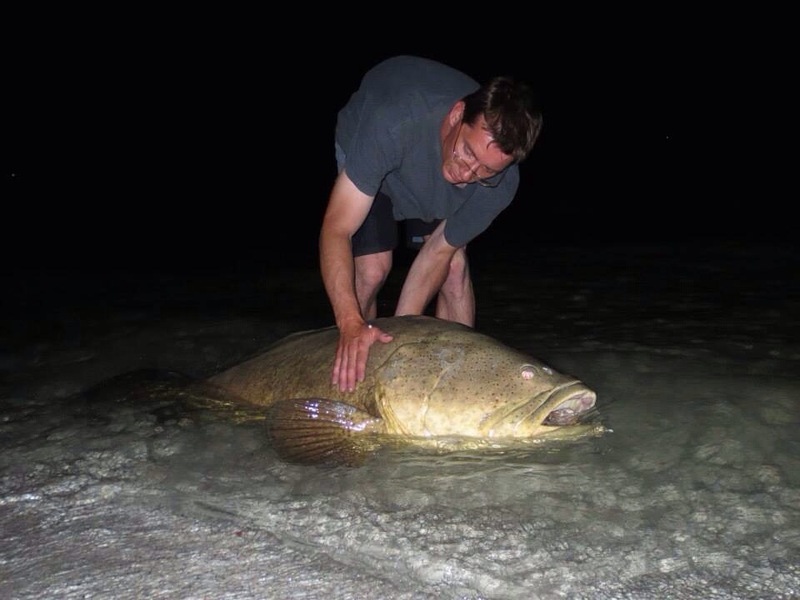 Jim pulled this heavy girl back out into the dark waters and helped her swim away! 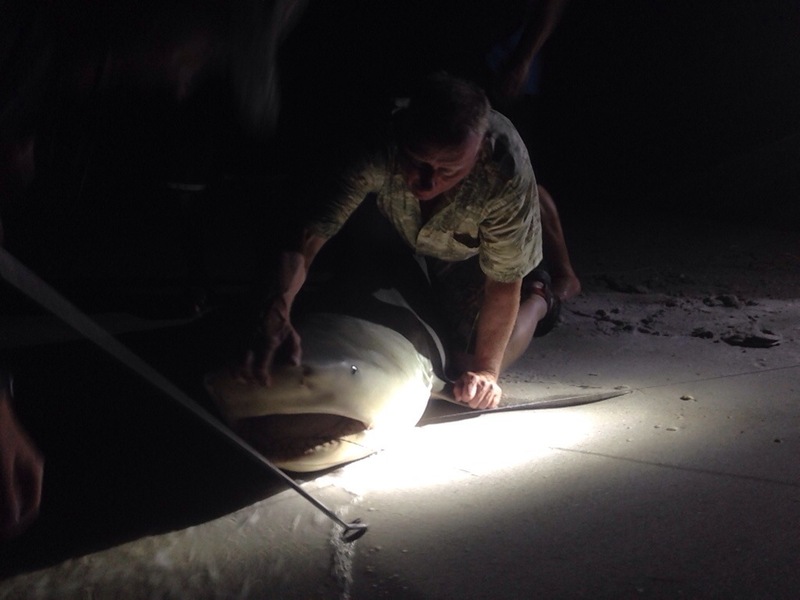 The best part of tag and release shark fishing is teaching others! Thanks Jim and family for letting us tag her! Caleb Ketter Up the Peace river its getting good for shark. Amanda Boley – In marathon key this week. Beautiful weather and great fishing! We have pulled in several dolphin fish, a nice sailfish, several tuna…so far! We are catching some nice size keepers as close as 3 miles out. It’s a great week for fishing in the keys! The C.C.A. needs at least 20 Volunteers for about 2 hours. When is 8:30 am Saturday June 28th. oyster don’t grow on it, many other things will and they will ,make great fishing habitat. this is the kind of mats you will be building. bait the other white bait? bait the other white bait?. Since I wrote the article about the lack of bait, I get stopped about once or twice a day, people talking about white bait & thread fins, or the lack there of. and Every body is starting to think, Hey maybe the hundreds of us cast netting bait is having an effect. a bad one! and it has become a thing to take what you need not what you want, with the bait fish. and here is what to keep in mind. 2 if they are under that don’t take any more than you absolutely need. 3 never say the bait moved. 4 say we killed that school where’s the next one. The bait is showing up more around the markers and on the sand bar east side. Jug creek shoals has had quite a bit, and Placida near the trestle is holding bait, most of it is smaller. I learned that in south America a fish which is very prized for bait and for oil, has changed it’s spawning habits and is now spawning almost twice as often to avoid extinction, the same could happen with our schools of white bait, and water quality and temp, and many things are working against the bait, the only thing we can control as a single human, is not to fertilize our lawns in the summer only after the rainy season is over. and only take the bait we need not what we want. I have seen people change how they think and how they handle fish, over the years, we will fix this as well. it will just take time. Good news is we will. thing else along the beaches, take a couple different colors with you. fishin partner another color. straight retrieve no real jerking or jiggin required. rim canal. this is Flying fishin heaven. Yes you can really catch a Tarpon here with a fly. sink then shot towards the surface. The fishin up around hog island and on the east side has been good, But like the weather, better in the morning, Snappers, Red fish both are thick on the east side. But keep a weather eye out. try not to let the storms get between you and home. Fishing the south end of the concrete reef. Seen a few tarpon roll. I just hooked into a 3 1/2-4 ft tarpon lost it up next to the boat. Hitting live baitfish. Had one shark on the cut bait line but left the head on the hook. Mackerel hitting live shrimp. I got til Sunday to land a tarpon or shark then back to Chicago.